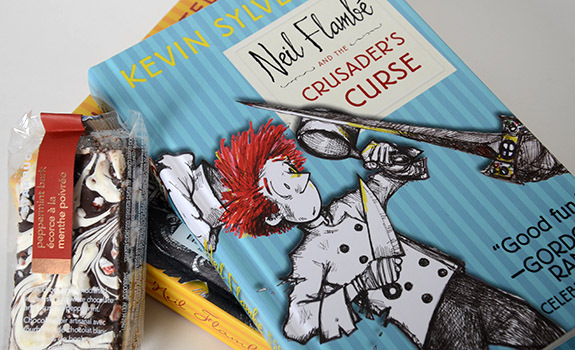 Neil Flambé books and peppermint bark from Starbucks. Good reading for kids, and good snacking for adults. It’s Dec. 24, which means you’re too late for online shopping, Clicky McGee. You’re going to have to go out into the world, interact with people and listen to tediously overplayed Christmas music through tinny shop speakers. Or wear earplugs. Your call. On the plus side, you’ll get to support local businesses with your holiday money, and that’s a pretty great thing. Calgary, the city where NEAROF! is based these days, was hit by a major flood this year, and local businesses in those flood-affected areas have been struggling to get back up and running. I normally like to shop local, but this year’s events gave me extra incentive. It’s worth noting that, unlike with many other gift guides, nobody has paid us to put any of these items on our list. They’re on the list because we like them, we think they’re great and we think you’re great. Since becoming a parent, I’ve started to understand just how major a role adults play in helping kids to understand food. If you’ve got a budding chef on your list, give a gift that encourages them to keep tinkering in the kitchen. If they don’t already have one, a child-sized apron is a great gift. It helps them feel like they belong in the kitchen, that they’re participating and taking ownership of the food preparation process. A chef hat of some sort would also be awesome. There are countless cookbooks out there aimed at kids, so dig around and pick one that seems right. Some kids prefer cooking, while others prefer baking. Some love a particular ingredient, or have a pet interest. Cupcakes, say, or cake decorating in general. Or maybe you’ve got a son who just can’t get enough asparagus. Who knows, right? In the last few years, iPhone and iPad apps have become a major force in cooking, turning the traditional cookbook into a more interactive, multimedia-enhanced experience. Consider gifting a card for the app store of your choice, depending on the device your gift recipient uses. If you buy an Apple App Store gift card for an Android user, you’re throwing your money out. Research first before paying for any gift cards. Restaurant gift certificates are a good way to give someone a push to try a particularly great restaurant you’re willing to bet they’ll like. Don’t give too small or large an amount, and keep in mind the likely price of a meal for two. Too little and they’ll have $10 toward an $80 dinner (whoopee). Too much and they risk having money left over; that’s not terrible if they love the restaurant, but it’s wasted cash if they didn’t have a good experience. Also consider giving a certificate to a restaurant you know they already love, as you know they’ll use it. Also note: Christmas isn’t the time to make a stupid point with your gift: don’t give a vegetarian a gift card to a Brazilian steakhouse where they serve grilled meat on giant swords. If it’s just a small gesture you’re looking for, embrace the spirit of the season by, you know, picking up the coffee tab for a friend or colleague during an office coffee run. Even a simple gesture, like buying and splitting a treat at a café (like the pictured Starbucks Peppermint Bark, is the sort of thing that says “you’re awesome” without being strange or out of place. Little gestures done out of kindness with nothing expected in return are a wonderful thing that anyone can get behind, regardless of seasonal holiday affiliation. Of course, a cookbook is always recommended, though with the caveat that you must know your gift recipient well enough to know their cooking passions and their level of expertise. There are too many good cookbooks to mention, and it’s not a one-size-fits-all thing. Are they bread-obsessed? Get them a great bread cookbook. Where it gets tricky is knowing their definition of “great,” as well as what would be too complicated or too simple. Also, pay attention to the reputation of the publisher. There are lots of fly-by-night cookbooks with beautiful food photos that are horribly edited and stocked with recipes that haven’t been thoroughly tested. Also be aware of the cookbook’s country of origin. Availability of ingredients and listed can/package sizes can vary from place to place. Oh, sure; why not. I’ll break that “too many to mention” rule in the last paragraph by cheerfully recommending two cookbooks. The first, ATCO Blue Flame Kitchen’s Holiday Collection 2013 cookbook, has a personal connection – I work there, and I’ve sampled enough of the recipes to know there’s some amazing stuff in there. The recipes are easy to make, and there’s a huge variety of dishes to try, even well outside of the holiday season utility implied by the name. You can find it at Save-On-Foods, Calgary Co-op and Safeway stores throughout Alberta, all for a super-reasonable $15. Go pick it up before the shops close early for the day. Also amazing is Alice Eats: A Wonderland Cookbook, the amazing new cookbook from Pierre A. Lamielle and Julie Van Rosendaal. The concept is brilliant: take the cherished story of Alice’s Adventures in Wonderland, develop recipes to match the culinary references (with liberal interpretation, of course), add pretty, helpful food photos, then ornately illustrate it with bright, colourful, quirky drawings that are perfectly suited to the text. There are tons of recipes in here I’m dying to make over the holidays. And best of all? It’s a local Alberta cookbook. Track down a copy, get reading, and get eating.